As scientists work to answer progressively complex questions about the earth and its changing climate, they are becoming more aware of the importance of communicating their findings to the public. To improve the likelihood that their messages are heard, understood, and made accessible, they are increasingly turning to art. Recently, BIOS hosted three artists—each with a different background and preferred artistic medium—who traveled to Bermuda as part of two ongoing research projects funded by the National Academies Keck Futures Initiative (NAKFI). The Futures Initiative fills a gap in federal funding by providing seed grants that allow scientists from different disciplines to focus on new questions, while also encouraging them to work with artists and designers to foster creative approaches to addressing global issues. 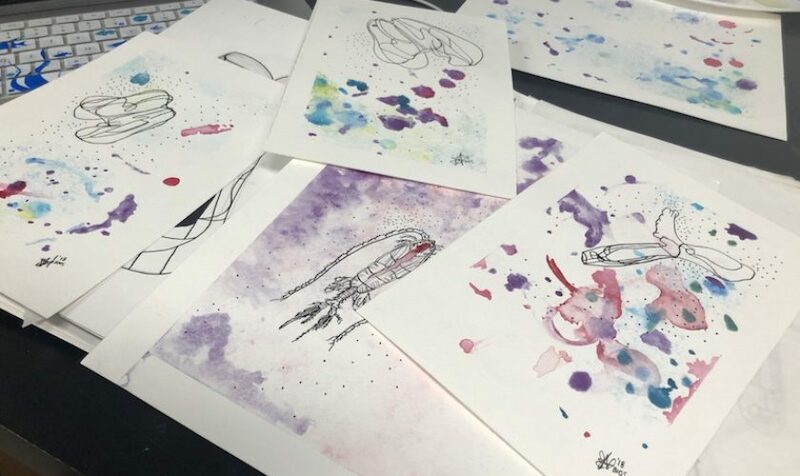 We sat down with these artists, as well as the scientists involved in the projects, to understand more about their collaborations and what they are learning, both about the research topics and the nature of science-art partnerships. 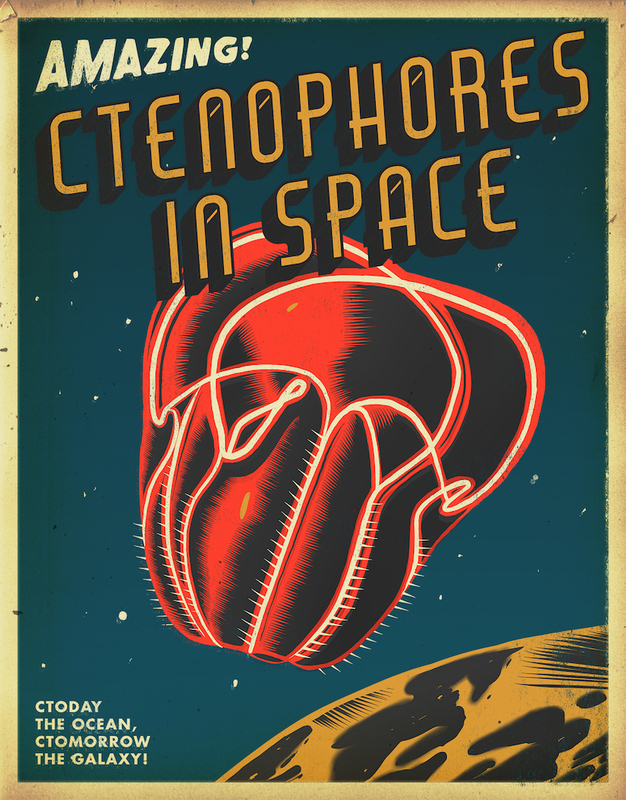 Modeled after advertisements from the 1950s, this piece of Jacobs’s artwork has fun with the silent “c” in “ctenophore” while highlighting the organism’s rows of hairlike cilia, which are being studied as a model of metachronal motion. In 2016, Jacobs was part of a group of artists invited to the NAKFI annual conference in Newport Beach, California, and tasked with working as a visual documentarian of the event’s proceedings. While there, she met David Murphy, an assistant professor in the department of mechanical engineering at the University of South Florida in Tampa. Inspired by the conference, Murphy submitted a grant proposal—along with Margaret Byron, an assistant professor in mechanical engineering at Penn State (Pennsylvania)—to NAFKI and invited Jacobs to join his team as an artist-in-residence. The project, “Swimming Across Scales: Metachronal Rowing in the Deep Blue Sea,” uses two marine organisms as models of metachronal motion: mantis shrimp, marine crustaceans averaging 3.9 inches (10 centimeters) in length, and ctenophores, a group of invertebrates often known as “comb jellyfish.” The term “metachronal” describes a specific type of movement in which the organism’s legs (or, in the case of ctenophores, small hair-like appendages called cilia) move in a sequential action, one after the other, producing a wavelike motion. “My interest is in making science interesting, accessible—and beautiful,” Jacobs said. 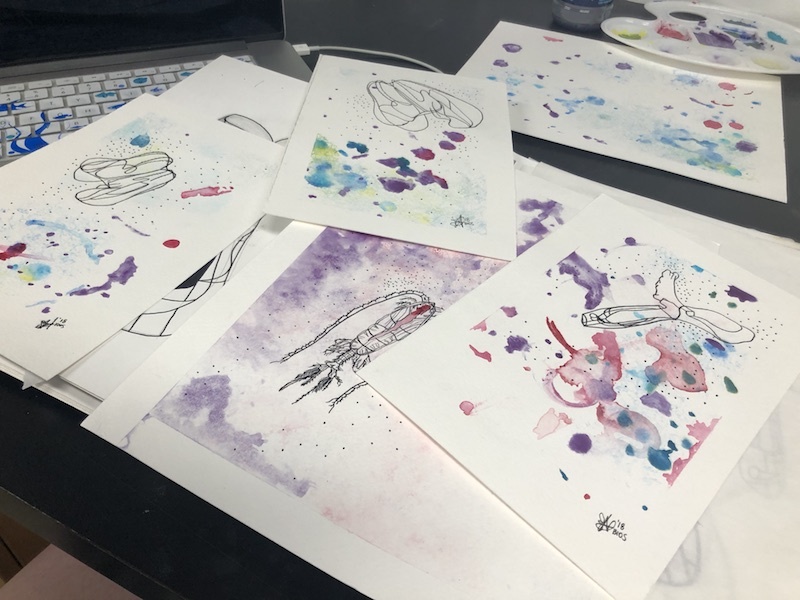 Newton’s work includes these illustrations of pteropods, whose colorful backgrounds were painted with water spilled onto watercolor paper while the scientists looked at samples in the laboratory. The medium Newton uses in her artwork often changes to take advantage of the setting and what materials are available. During the summer of 2016, Newton heard about a call for local artists to work with the Oregon State University (OSU) Department of Microbiology to produce art for a juried exhibition designed to offer a unique perspective on microbial systems that impact human health. 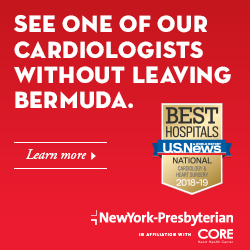 By September of that year she was in Bermuda working alongside Stephen Giovannoni, a professor at OSU, on a three-day scientific cruise aboard the BIOS research vessel Atlantic Explorer. Newton stayed in touch with the scientists she met aboard the research cruise, including Amy Maas, a comparative physiologist and biological oceanographer at BIOS. Early last year, as Maas and Murphy applied for a NAKFI grant, Maas reached out to Newton and asked if she would be interested in collaborating. Maas, herself a product of a liberal arts education, has always found interdisciplinary investigations to be fulfilling and sources of enjoyment, curiosity, wonder, and fun. And, although she admits that she is still learning how to engage in a truly interdisciplinary way—where science and art are both parts of the same human drive to know and understand—she feels this type of work is something she will be doing for a long time to come. For Newton, now a student in the Environmental Arts and Humanities Program at OSU, this was a perfect opportunity to combine doing what she loves—making art—with the research required for her graduate thesis. The NAFKI-funded project, titled “Swimming in Sea Butterflies: Physics, Physiology, Ecology, Art and Design Inspiration for an Aquatic Micro-Aerial Vehicle,” examines the physics and motion of pteropods, a type of open-ocean dwelling snail, for insights into their fluttering, butterfly-like swimming mechanics. For her thesis, Newton is looking at how technology is being used to understand nature. One of the three chapters in her dissertation will be about the pteropods that Maas and Murphy study, and which Newton is taking time to photograph, paint, capture on video, and learn about by working with scientists in the climate-controlled environmental rooms at BIOS. Newton envisions the final product for this project, which will conclude in the first half of 2019, as a combination of visual imagery—mostly paintings—her thesis chapter, and some sculptural items she is creating to highlight the connection between technology and nature. Her thesis will also touch on the experience of doing interdisciplinary work, which allows her the opportunity to share her own experiences over the last few years. Last year, a collection of drawings, paintings, and photographs—representing both her work with Giovannoni and her first visit to BIOS for the NAFKI project—won the Best of Show Art Award at the 2017 State of the Coast conference, an annual event hosted by Oregon Sea Grant that brings together scientists and citizens to engage in issues facing the state’s marine environment. 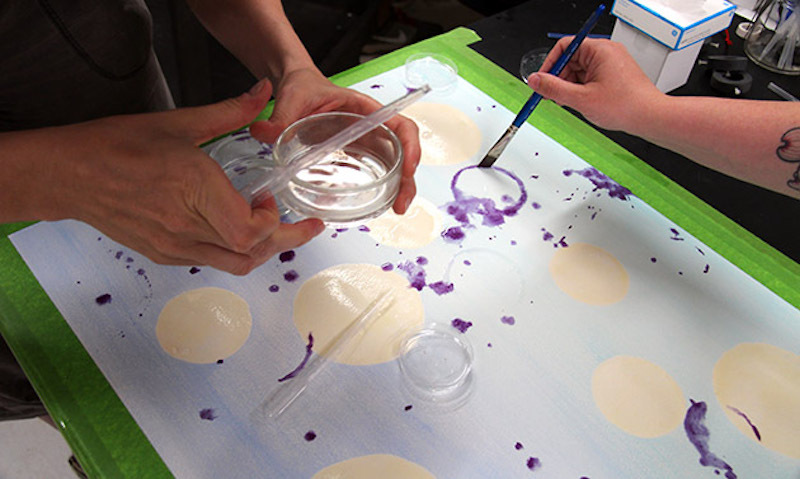 As scientists process water samples containing tiny sea snails, or pteropods, artist-in-residence Samm Newton (right) uses spilled water to paint on watercolor paper, forming the basis for future illustrations of the tiny animals being studied. Newton is part of a collaborative investigation, funded by the National Academies Keck Futures Initiative, that brings scientists and artists together in collaborations that help communicate research, and the scientific enterprise, to the general public. Unlike Jacobs and Newton, Dianne Finch is discovering a passion for art later in her career. In 1999, with a bachelor’s degree in economics from the University of Massachusetts Boston, she was hired by the Associated Press as a news data editor. This unique position was her first exposure to the field of “data visualization,” which presents large sets of data in visual, graphical formats that allow information to be communicated more clearly and efficiently. In 2000 the Associated Press tasked Finch with creating relational databases using U.S. Census data, which led to her first published story that she described as a “data-driven story on racial integration” in the U.S. With this, Finch realized that her background in computers and data might be particularly useful in journalism, so she went back to school, enrolling in Columbia University in New York where she later graduated with a master’s degree in journalism. Today, Finch describes herself as a “digital journalist, educator, and data visualization consultant.” She is a visiting lecturer in communications at Salem State University in Massachusetts, as well as an assistant visiting professor at Kent State University in Ohio, and offers consulting services to scientists and not-for-profit organizations. She recently finished writing her first book, “Big Data in Small Slices,” which is intended to introduce college students to science journalism. One of the book’s four topics is ocean acidification, which led Finch to Maas, who studies the impacts of ocean acidification on pteropods. Over the course of a few months, Maas provided Finch with scientific papers, data sets, images and videos that, eventually, would be turned into a supplement for the book and material for Finch’s data visualization website. This spring, Maas reached out to Finch and invited her to come observe her NAKFI-funded work on pteropods. For Finch, who had just finished her book, it was ideal timing and a great opportunity to spend time observing scientists while looking for story ideas. The companion website to Finch’s book features multiple ways for the user to interact and engage with scientific data. This screen shot is a sample of an interactive visual based on data from Maas’s study into the impacts of ocean acidification on the shells of pteropods. 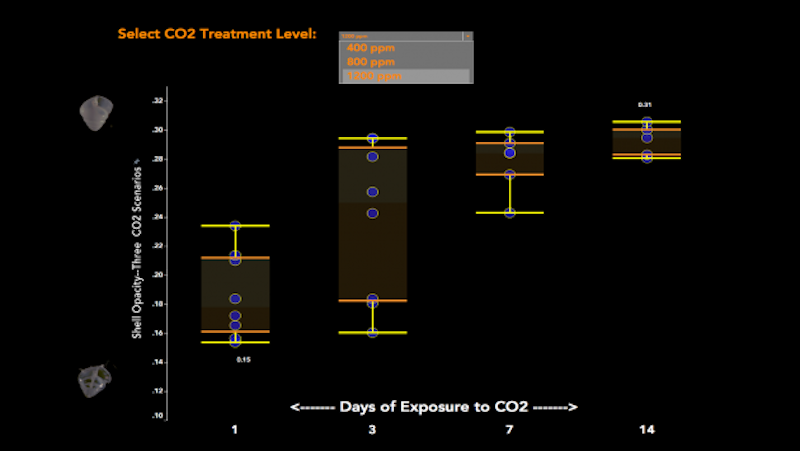 Here, the user can select the level of carbon dioxide (CO2) in the water and watch how this impacts the quality of pteropd shells. The images of the pteropods on the vertical (y) axis are a visual demonstration of the fact that pteropod shells increase in opacity, or turn white, as the carbon dioxide levels increase. This type of visual is embedded into a large narrative that describes the importance of the pteropods’ need to remain invisible to predators.